The effectiveness of international research and development efforts in Africa has been questioned on scientific, administrative and social grounds, and for the lack of conceptual models to place observed eco-social change in interpretive dimensions. To illustrate how the latter problem may be addressed, we examine the ongoing suppression of trypanosomiasis disease affecting cattle in an agro-pastoral eco-social system in the sparsely fertile and semi-mountain region of southwest Ethiopia. 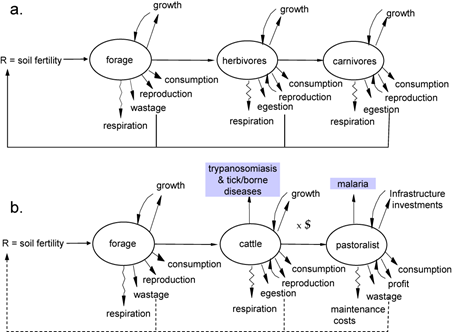 In our analysis, we use physiologically based tritrophic demographic ecosystem models (EMs) of pastures, cattle and pastoralists, and a bio-economic model (BEM) that includes the EMs for cattle and pastoralists as dynamic constraints in the objective function that maximizes the utility of consumption under different level of disease risk in cattle. An East African grasslands systems without (a) and (b) with disease constraints. The dashed line in (b.) indicates that only part of the waste is recycled back to the soil, and the symbol $ indicates the conversion of the mass/energy flow into monetary units. A holistic view of a hypothesized closed East African agro-pastoral systems showing disease constraints (shaded area), land allocation and weather and edaphic variables. Both field data and model analysis show that the reduction in trypanosomiasis leads to increased cattle and human populations, and an erosion of pasture quality that compromise system sustainability and resilience. The demographic changes are also expected to increase the risk of tick borne diseases to cattle and malaria in humans introducing additional eco-social consequences that further threaten the agro-pastoral system. Here-to-fore, tick borne diseases and malaria have been less important in this area of Ethiopia. We suggest that ecological and bio-economic analyses are essential for focusing research and for developing policy designed to achieve sustainable management of renewable resources in sub-Saharan Africa and elsewhere. 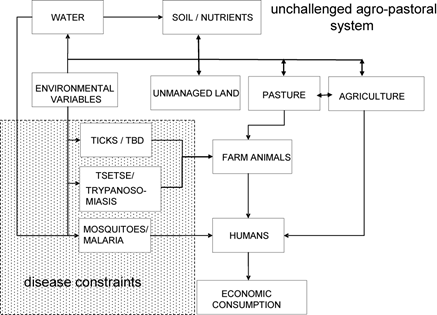 Gutierrez, A.P., G. Gilioli and J. Baumgärtner (2009) Eco-social Consequences of Disease Management in East African Agro-Pastoral Systems: Policy Implications. Proceedings of the National Academy of Science 106: 13136-13141. Gilioli G., Groppi M., Vesperoni M.P., Baumgärtner J., Gutierrez A.P. (2009). An epidemiological model of East Coast Fever in African livestock. Ecol. Modelling 220:1652-1662.